U.S. Sen. Frank Lautenberg, a New Jersey Democrat, has been diagnosed with stomach cancer, his office said in a statement Friday. (CNN) - U.S. Sen. Frank Lautenberg, a New Jersey Democrat, has been diagnosed with stomach cancer, his office said in a statement Friday. 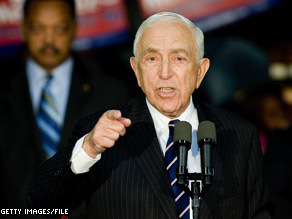 Lautenberg, 86, is not up for re-election until 2014. "After several days of hospitalization and testing, Sen. Lautenberg's doctors have diagnosed that he has a B-cell lymphoma of the stomach," the statement said. "This is a curable tumor, and will require treatment over the next few months." Dr. James Holland of New York City's Mount Sinai Medical Center, who is treating Lautenberg, said that he expects "a full and complete recovery" from the cancer. Lautenberg, Holland said, will receive chemotherapy treatments administered roughly every three weeks. "We anticipate that he will receive between six and eight treatments, and in between treatments, the senator is expected to be back at work in the Senate," he said. Lautenberg, a New Jersey political veteran, was first elected to the Senate in 1982. He retired in 2000, but ran again in 2002 after Sen. Bob Torricelli, who was tainted by scandal, suddenly withdrew from a re-election bid. 86 years old. Wow, and people think politicians are out of touch? I just can't understand why. Well finally, a way to get rid of this decrepit do nothing loser. Now maybe we can get ourselves a real senator.